I attended an interesting lecture by Sir Partha Dasgupta the other day. Discussing Garrett Hardin's classic "tragedy of the commons", Dasgupta suggested that social norms would ensure that the environmental degradation Hardin envisaged would seldom happen. Adding together the component partial utilities, the rational herdsman concludes that the only sensible course for him to pursue is to add another animal to his herd. And another; and another. . . . But this is the conclusion reached by each and every rational herdsman sharing a commons. Therein is the tragedy. Each man is locked into a system that compels him to increase his herd without limit—in a world that is limited. Ruin is the destination toward which all men rush, each pursuing his own best interest in a society that believes in the freedom of the commons. Freedom in a commons brings ruin to all. It is a seductive argument, and Hardin is not the first to argue it. He is one of a long line of Cassandras warning about mankind's tendency towards overpopulation and depletion of finite resources. Hardin is unashamedly Malthusian in his call for the removal of the freedom to breed. Hardin's paper assumes that there is no co-operation between herdsmen: each herdsman maximises his own profit by making as much use of the commons as he possibly can. This is a Nash equilibrium in which no-one has any incentive to modify his behaviour in order to maintain the commons. The inevitable result is that the commons is progressively degraded. Implicitly, Hardin assumes that even though degradation of the commons means that the herdsmen's profits are collectively reduced, individuals still do not modify their behaviour because they believe that their individual profits will be unaffected. In effect, every individual believes that he can compensate for falling collective profits by taking a larger share of the pie. Dasgupta creates an alternative model in which cooperation is enforced by the participants themselves. He posits that when a commons is run as cooperative and profits are shared, the members play what is termed a "grim" strategy. If an individual tries to maximise his own profits at the expense of the rest, the other members impose punishments varying from shunning (exclusion from the cooperative) to physical harm. This is done by mutual consent, not by appeal to a higher authority. The weakness in this model is that it relies on all members being prepared to punish transgressors: for this reason, members who refuse to punish transgressors are themselves regarded as transgressors and shunned or punished by the rest. But of course Dasgupta's "extreme cooperation" model suffers from the same problem as Hardin's "extreme individualism". It may not exist in reality. There may be isolated and temporary examples of Dasgupta's model, just as there may be isolated and temporary examples of Hardin's model. Indeed, one may give way to the other. I suspect that neither model adequately reflects reality - although that does not wholly invalidate them. Even unrealistic models can still tell us something about human behaviour. You can see one of the houses on the far right-hand side. The trees shield the green from the main road. 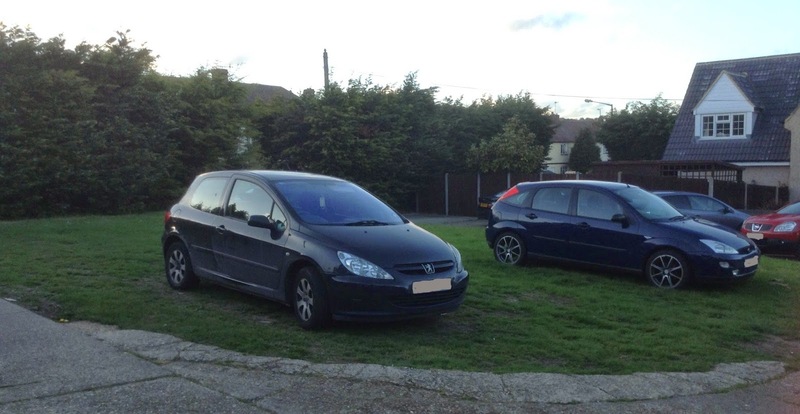 In this image there are two cars parked on the green: the other two cars visible are on hard standing in front of the house. The green is collectively owned by the eight households and outsiders are not permitted to use it. This therefore is a classic "common". As it is in the UK, and suburban British people aren't generally herdsmen, the households don't use it to graze animals (though it perhaps was used for this purpose when the houses were built nearly a century ago). They like to look at the green, and their children like to play on it. And they also like to park cars on it now and then, especially when they have visitors. For many years, the various uses of the green were more-or-less compatible: parking was occasional, children played nicely and the green was regularly mowed by one of the residents. But in the last few years, things have changed. Now, there are cars on the green constantly: heavy vans are frequently parked on it too. The surface of the green turns to mud in the winter. It always did this to some extent, but it used to recover in the spring. But now, as can be seen in the picture, there are large bare patches and potholes. Mowing is a problem because of the constant parking and the uneven surface. The green is being progressively degraded due to over-parking. At first sight, this looks like a prisoner's dilemma. All the households are maximising their use of the green for parking. Car ownership is increasing, and therefore the green is used more and more for parking - which means it is no longer safe for children to play on, and no longer attractive to look at. Parking, which is destructive to the green, is crowding out other uses. Non-cooperation ensures a bad outcome for everyone, but no-one has any incentive to cooperate. However, on closer inspection, this isn't right. It turns out that most of the cars, and all of the vans, parked on the green belong to one household. The others still make occasional use of the green for parking, but their usage has not increased. So this is not a non-cooperative Nash equilibrium, with everyone maximising their use of the green for parking. This is a Dasgupta conundrum - a cooperative model in which one individual is choosing not to play by the rules. By maximising their own utility, that household is reducing the utility of other households. What might the other households do about this? There are several alternatives. 1. They could give in, accept that parking is more important than an attractive green, and concrete it over. Indeed, one of the residents suggested this. But others were horrified. Looking out on to a degraded green was still better than looking out at a car park. And concreting it over would reward rule-breaking. 2. They could attempt to persuade the rule-breaking household to change its ways. In fact one householder did try, a while ago. But there was no support from the others. Some of them sided with the rule-breaker ("he can park there if he wants"): others simply refused to get involved. So the attempt failed. Dasgupta's idea that the community would cooperate to force out the rule-breaker doesn't seem to apply in this case. Indeed, for a while it looked as if it would be the complainant, not the rule-breaker, who would be forced out. She hadn't lived there as long. 3. They could stop the rule-breaker parking on the green, for example by parking their cars along the edge of the green to deny the rule-breaker access. But this would sour relationships among the community. And people want to be able to move their cars. 4. They could collaborate to repair the green. But filling in the potholes and re-seeding the bare patches would be pointless while parking continued on the green. Simply repairing the green would require a commitment from everyone to stop parking on the green while it recovered and limit parking thereafter. But the rule-breaker does not want to stop parking on the green, and so far the community does not wish to force them to. Therefore there is no point in repairing it. 5. They could fence the green so that it cannot be parked on at all. But that would mean the other households giving up their right to use the green for occasional overflow parking. Running throughout this game of "Yes but" is something very British - a sense of "fairness". Everyone wants to be able to park on the green when it suits them. So no-one wants to prevent anyone else parking on the green. Even though one household's use of the green is ruining it for everyone else, it wouldn't be "fair" to stop them. Dasgupta talks about the importance of "social norms", and points out that a "social norm" is by definition a Nash equilibrium. So in this case, it seems that it is not so much individual utility maximisation as the British sense of fair play that ensures the degradation of the commons. The real tragedy of the commons is that even in a cooperative model, preserving community relationships and social norms may be more important to the members than maintaining the commons. Degradation of the commons does not require all members to be pursuing their own selfish interests: all it takes is one member pursuing their own interests and the others turning a blind eye. The householders have been talking. Many people are concerned about the state of the green. The rule-breaker still doesn't care, but the others are losing patience. After all, it is their green too. Recently, the eight households collaborated to buy a new mower for the green. And they are talking about repairing the potholes, re-seeding the bare patches and laying reinforcing mesh to support the surface so that cars can park without damaging it. So we seem to have a dual equilibrium. Communities tolerate individual utility-maximising behaviour (Hardin) until degradation of the commons starts to hurt everyone. Then they switch into cooperative mode (Dasgupta). How coercive the cooperation needs to be depends on the strength of community relationships and their underlying social norms. In this case, the British sense of "fairness" also dictates that one household should not be allowed to wreck a shared resource. It was inevitable that this particular community would eventually do something about it. Interestingly, the community's approach is not coercive, it is creative. They are collaborating not to enforce rules, but to devise a solution to a shared problem. And once again, the British social norm of "fairness" comes into play. You see, the rule-breaker has a legitimate need to use the green for parking more than others. The reason is the green itself. The green is square, and the houses are laid out on three sides of it. Most houses have wide forecourts with room for many cars. But the rule-breaker's house is one of the two corner houses, which have much smaller forecourts than the other houses. There simply isn't much room for parking. As their children grew up and acquired cars and, latterly, vans, they ran out of room. So it is not so much that they are maximising their utility at others' expense: rather, they are simply trying to secure for themselves what others in the community already have, namely adequate parking. The other households know that the rule-breaker has a shortage of parking, so they regard it as unfair to restrict parking on the green for this household. They want to find a "fair" solution. Hence the reinforcing mesh. Hardin's coercive solution to over-population was successfully used in China, to the horror of many in the West. But was it necessary? In countries with inadequate social safety nets, poor healthcare and high levels of poverty, people have legitimate reasons to have many children. We now know that birth rates fall naturally as living standards rise. So (being terribly British for a moment) a "fair" solution to over-population is not to prevent breeding, as China did, but to make it unnecessary by addressing the social problems that encourage people to have many children - problems that are already largely solved in the West. Of course, the British concept of "fairness" has its own contradictions. But Malthusian problems are much better solved through creativity than coercion. It might depend on the number and nature and predictability of the variables. Too many and too complex and the commons cannot handle it. History has too may examples of breakdowns and bloodshed to be comfortable about any theory. And too many occasions when a small elite or even single ruling family have come to exercise absolute rule. The trick is to maintain the balance. In the West for a short spell we have had some sort of balance but can it hold and have we already blown it? In this case, the rule breaker has a legitimate claim, at least in the eyes of the other residents. I am glad they are finding a creative solution to their dilemma. But in every human population there are individuals best described as "jerks." They are highly creative too -- within the rules of the situation and the energy limits of the decent people around them, they push their own use of the commons to the sticking-point, and just beyond. They will, in fact, spend considerable energy in doing this, especially if approached by others to reduce their predations. They pretend to not be able to take a hint, but in truth they are far less oblivious to social cues than they let on. The tragedy of the commons then consists of rational people making rational choices but also jerks making jerky choices. Is there a better way to reduce their impact? Nice post. You could swap your car parking analogy for the oil markets. Exactly the same going on with the same flipping between models. The problem you are complaining about is nothing to do with common anything. You say (but provide no evidence for) the land being owned 'collectively' by eight households. Let's suppose that's right. Then each household is entitled to the returns from its share of the the asset. Clearly the 'problem' is that you are underpricing the asset's use. You need to raise your parking prices. Your free rider will just continue to appropriate your property until you do. I love the adoption of pretty much universal human values as particularly British ones. In this case, 'fairness'. As if fairness is anathema to Yanks, or Russians, or the Sudanese, or anyone else. Exactly the same thing happens with 'religious values', like don't murder. Which was, of course, perfectly acceptable before Moses got his fragile tablets. Honestly. Hmm. As a Brit who lived abroad for the last 20 years, I tend to agree with the characterisation of mid-20th century British values as being about "fairness". I do not think that much of it remains, though: those values have been replaced by American-style commercialism and money-making greed alongside very bad European-style bureaucracy, not too far removed from the Czechoslovakia of Franz Kafka. The original fairness needs some amplification for foreigners to comprehend. It implies that legal rules need not be followed, if the principle of fairness would surely be breached. Try telling that to a German; or to an American who would lose money because of it. In essence, the fairness principle used to be a social mechanism to negotiate difficult cases where rigid rules could not predict outcomes properly, and allowed human beings to speak directly with each other as human beings. Thatcher hated it, and has managed to destroy it for the most part -- along with the war criminal Blair and the Etonian muppet Cameron. It's a myth that it ever existed. I'm Welsh. Believe me, "British" does not equate to "fairness", nor anything resembling it. @Anonymous: I, too, am Welsh. Not sure why that should make a difference, though. Is Cassandra right choice of word there? The point about Cassandra was that her predictions were true, but nobody listened to her. How do you say "dead cat" in Latvian? Did Osborne Pause Austerity in 2013?